I got an opportunity to join in on the writing process. It wasn’t on a heartwarming, emotional piece about helping the needy or any of the moving biographical videos about people who are changing the world… No, the client was trying to get people to Las Vegas for their convention and any ideas were welcome for a short promo video. Any ideas, you say? Haha! Finally a chance for me to get weird! Obviously there are budget constraints and logistics that prevent certain ideas from even being suggested (I mean, I guess we probably can’t get Tobey Maguire…), but while brainstorming, something clicked in my head. 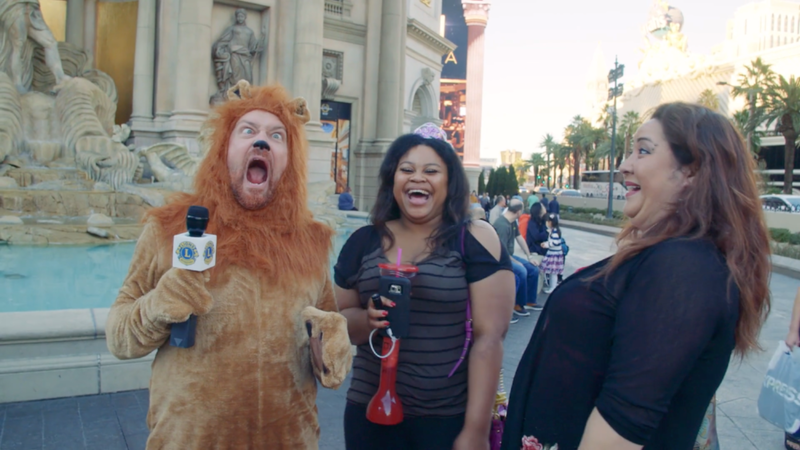 WHAT IF WE WENT FULL ROGER RABBIT MEETS THE HANGOVER, AND HAD A CARTOON LION INTERACTING WITH LAS VEGAS PEOPLE? This seemed to go over well enough in the brainstorm, and I was tasked with creating a first draft. My juices were flowing, and I created a script that I genuinely enjoyed. I was cracking myself up over here. I read it at a follow-up meeting and it got some pretty good laughs. Hearty chuckles at least! When the script got submitted to the client, some of them really dug it; it was very different in tone (and craziness) from what we usually do for them. But the head honcho had a minor issue with it: the main character. I mean to say he had a major issue with it: he hated the darn cartoon lion. LET’S JAM A COMEDIAN INTO A FULL BODY LION SUIT AND DO A FUN, ADMITTEDLY-LESS-CHEESY-THAN-A-CARTOON TREATMENT. Collaborating with them on this idea led to an even better idea. So I was sent back home with a new scripting assignment. Wow, this was fun! I wrote a new script full of new jokes and bits that a LIVE ACTION lion could say, and even thought up some 30 second additional promos that could be shot on the side and turned into even more promo pieces. The client liked this script, but came back with some (very fair) alternatives to some of my jokes. After a few more revisions the script was approved, a dude was cast as the lion, our crew was flown to Las Vegas, and I was back to staring at Adobe Premiere timelines in a dimly lit room every day. And that’s the story of my brief assignment as a comedy writer, and the lesson of how collaborating with the clients during the writing process gave us all a better video. No, actually it was. I just didn’t know how to end this post in a good way. Again, I’m 99% video editor.